A Republican PAC released former CIA case-officer and Democratic nominee Abigail Spanberger’s entire federal security clearance application yesterday, including private information such as her Social Security number. The document, a national security questionnaire known as Standard Form 86 or SF86, is the highest level document for security clearance within the intelligence community. Spanberger is challenging incumbent Dave Brat for Virginia’s 7th District. The PAC, known as the Congressional Leadership Fund (CLF), has links to Speaker of the House Paul Ryan, and according to the New York Times, has raised over $100 million for Republicans this mid-term. 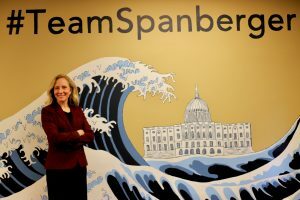 Spanberger also wrote on her astonishment that a domestic political group would release sensitive, private information, including her medical records, and wondered whether the document was illegally obtained through a state-sponsored adversary’s cyber attack. She then listed three demands asking CLF to destroy the unredacted SF86 forms and to not disclose any further private information, then threatened legal action if these demands were not met. The CLF obtained the information from America Rising, another Republican research PAC. America Rising says they used a Freedom of Information Act (FOIA) request to acquire this information, receiving the full unredacted document from the United States Postal Service. According to BuzzFeed News, American Rising may have obtained Spanberger’s Social Security number through LexisNexis. America Rising had been notified that the FOIA request had been forwarded to the US Postal Service three days after submission for processing, stating that certain information would be released “without consent from the individual.” However, according to the FOIA Exemption (b)(6), disclosing personal information about living individuals to a member of the public would require written consent from the person whose information they requested. Any government agency must withhold information that would clearly be an unwarranted invasion of personal privacy. Jones said the Spanberger campaign first became aware of the document leak in early August when one of their staff members got a call for a poll; one of the questions asked would you support Spanberger “more or less” if you knew she “taught at the Islamic Saudi Academy.” This piqued their interest in a potential leak, and Jones acknowledged the only way this information could be acquired is from the SF86 form. Later, at an event on Aug. 16, a reporter from the Associated Press confirmed they got the information from the CLF on Spanberger, which included her un-redacted SF86 form. Indeed, this is one of the claims now being used by the CLF to attack Spanberger. Their statement released yesterday said, “[The form] included information about Spanberger’s tenure working at the Islamic Saudi Academy in Northern Virginia.” The Islamic Saudi Academy of Washington was an international school funded by the Embassy of Saudi Arabia, located in Fairfax – Saudi Arabia is a long-standing ally of the U.S. 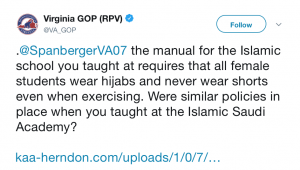 The Virginia GOP has already run with the information and has tweeted about Spanberger’s time spent at the Islamic Academy saying, “the manual for the Islamic school you taught at requires that all female students wear hijabs and never wear shorts even when exercising. Were similar policies in place when you taught at the Islamic Saudi Academy?” – a blatant anti-Muslim dog whistle. She closed by acknowledging that this is the broken system of politics that she is running to change. *Madelyne Ashworth contributed to this report.